After sustaining a low back injury in high school, Dr. Prinkey’s wrestling coach suggested he visit a chiropractor for help. Always considering a career in healthcare, this positive experience didn’t just help him feel and heal better, but showed him that health and a strong body could be achieved without the need for drugs or prescription medications. 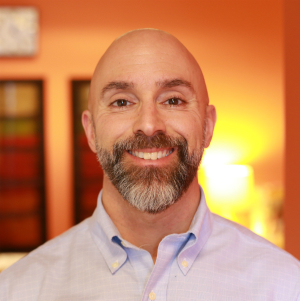 Dr. Prinkey decided to attend Duquesne University where he completed his undergraduate degree, and then made his way to the renowned Palmer College of Chiropractic to obtain his Doctorate in the field. Having been in practice for nearly two decades, Dr. Prinkey believes that the human body is an incredible creation! When your body becomes injured, stressed or plagued with an illness, your nervous system can become compromised. Through natural and safe chiropractic care, Dr. Prinkey aims to restore function and remove imbalances so that your body can function exactly as it was designed to. His ultimate goal is to help you and your family live the best life possible, in a state of optimal health and without pain. When he isn’t helping patients restore their health in the practice, Dr. Prinkey enjoys spending time with his wife and four children. As a family, they love outdoor activities and share in Dr. Prinkey’s love of music—Dr. Prinkey is engaged in lifelong learning and is working to achieve his lifelong goal of learning to play the guitar. Ready to help your body feel and function at its best? Contact us today to book your appointment. We look forward to helping you restore health to your life!